I got my digital-to-analog converter coupons in the mail today and immediately went to my local Radio Shack to “cash” them in. The letter from DTV2009.gov lists over 30 models, but this Radio Shack only had one model and both units in stock were on display. The model Radio Shack had in stock was the Digital Stream DTX9900. Although my coupons were for $40 each, the units were $59.99 so I ended up paying $24.94 each with tax. A bit annoying since I thought they would almost be free, but a small price to pay for free over-the-air digital television. On the box it says “Capable of receiving major and minor free HDTV off-air signals”. Am I crazy or are there really people who have HDTVs that are not digital? I guess early versions of HDTVs and HD monitors did not have digital tuners built-in. The term “HDTV capable” rings a bell. 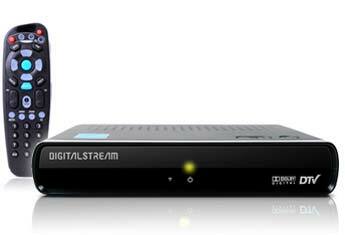 The box also says it supports Dolby Digital and is fully compliant with ATSC standards. Setting up the DTX9900 converter was easy. The unit works like a small receiver. You just plug in your antenna via coaxial cable and output to the television via coaxial or stereo composite. No S-Video output unfortunately. Follow the onscreen “For Dummies” instructions and it will automatically search for digital signals. In my area I was able to pick up over 30 digital channels. Other features of this model include parental control (V-chip), advanced closed caption, auto-matic time zone setting, and a remote control. I originally thought the converters would be more “behind the scenes”, but it works just like a receiver would from a cable provider. The converter becomes your “interface” to select channels. Probably the most fun feature of the Digital Stream DTX9900 is the display mode. You can choose between Anamorphic, Wide 16:9, Wide 14:9 and Zoom. Essentially this means you can tweak the broadcast to match its original format. Or, if you hate those black bars, you can choose Anamorphic or Zoom to fill your screen. After hooking up the converter I switched between the “Lakers vs. Golden State” game and Adam Corolla in “Dancing with the Stars”. Both broadcasts were clean and crisp, and looked natural in the 16:9 mode. But I can’t say there were not a lot of dropouts in the signal. I was using rabbit ears indoors, which could be the reason. Either that or the signals from the broadcast facilities were obstructed. To get a stronger signal try using a larger indoor antenna or better yet a rooftop antenna.